Welcome to Stable Craftwork! 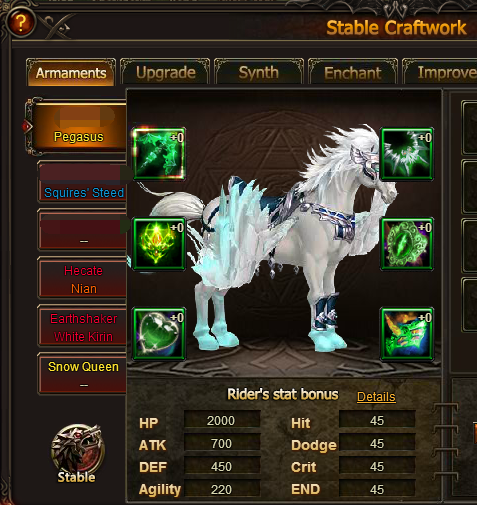 Much more stats can be added to your mounts! 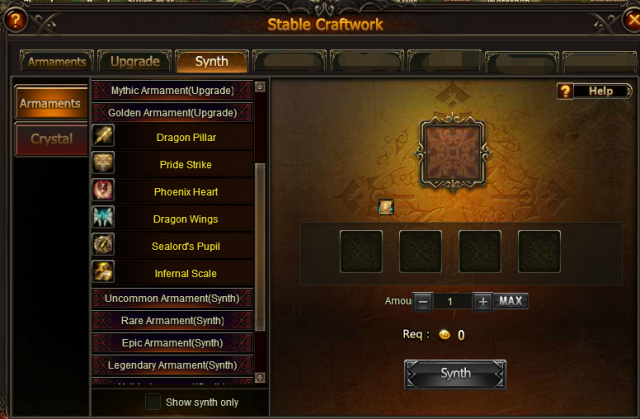 Click "Stable", and you will see the newly added icon of "Stable Craftwork" on the right corner of the interface. Or you can click "Armaments" directly in the right corner of the interface. 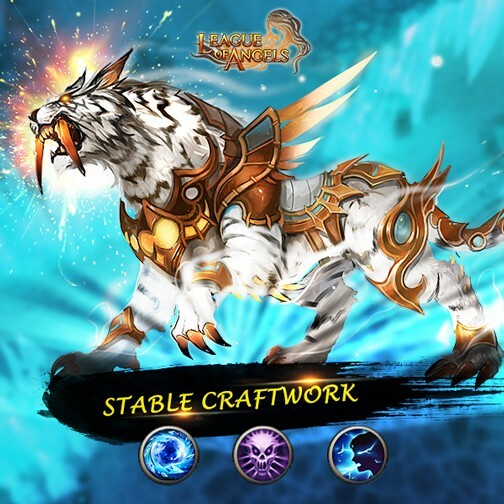 Stable Craftwork unlocks at Lvl. 74. 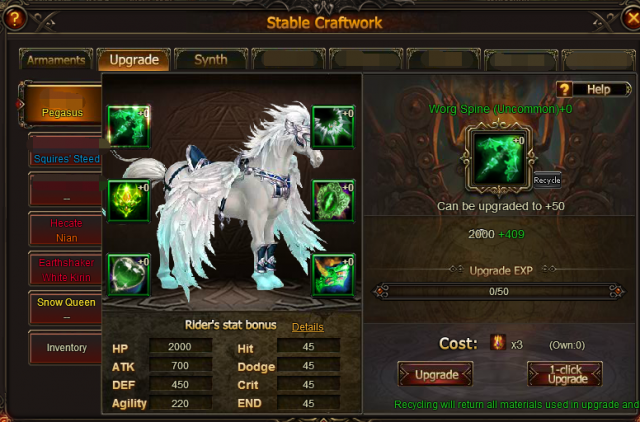 In this new feature, there are six places available for you to equip your mounts. "Armaments", "Upgrade" and "Synth" are among the first batch to open. There are six qualities in total: Uncommon, Rare, Epic, Legendary, Mythic and Golden. Attempts needed to upgrade armaments will depend on its quality. All mounts in Stable will receive an Armament (Common) automatically. Higher-quality armaments can be obtained through Alliance Expedition and new Gameplay (which will come soon). 2) Higher-quality armaments can be synthed by combinig 5 armaments of a lower-quality. For example, you can synth to get a set of Epic armament if you have FIVE sets of Rare armaments. The higher the quality of the armament, the more you must do to upgrade them! 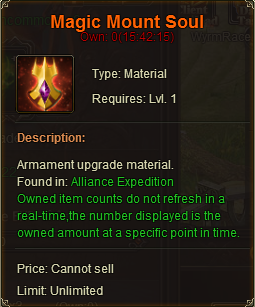 To upgrade these armaments requires specific items, which can only be gained through Alliance Expedition. When your Armaments reach Lvl. 35, Soul Chain will be open for you. Are you worrying about there aren't enough ways to get Magic Mount Soul? Are you looking for ways to gain more rewards( and bonus rewards)? 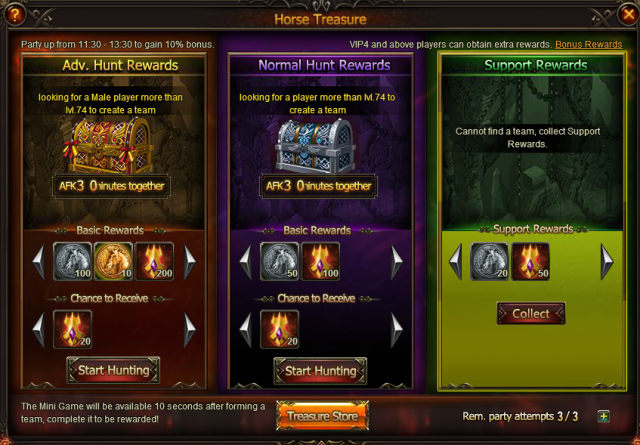 Our developers bring you a brand new Horse Treasure. Let's team up for more rewards! There are three kinds of rewards in total: Adv. Hunt Rewards, Normal Hunt Rewards and Support Rewards. Support Rewards: Even if you can't find the specified partners to accomplish the task, there is Support Rewards for you! Find the specific partner, create a team and complete a small task, rewards are yours! Quite easy, isn't it? Don't forget to check it out in the new version. More features in Stable Craftwork will be open soon. Stay tuned!